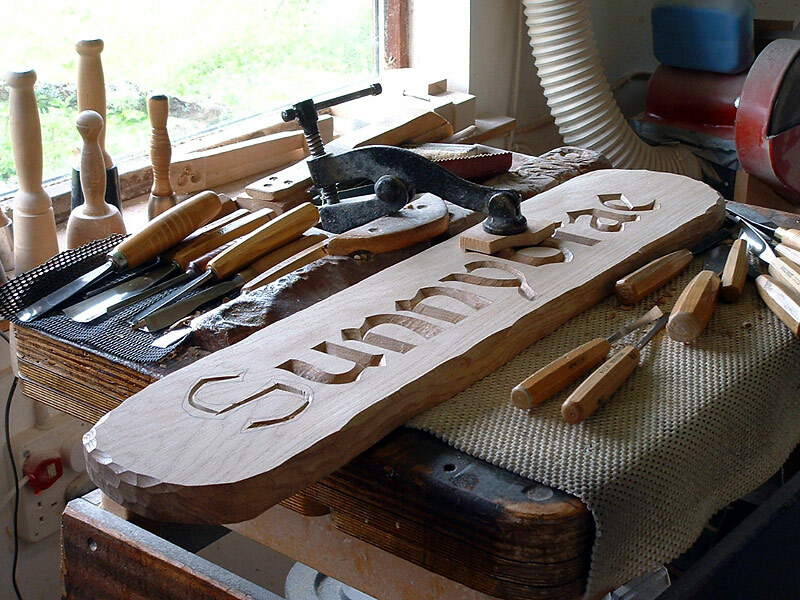 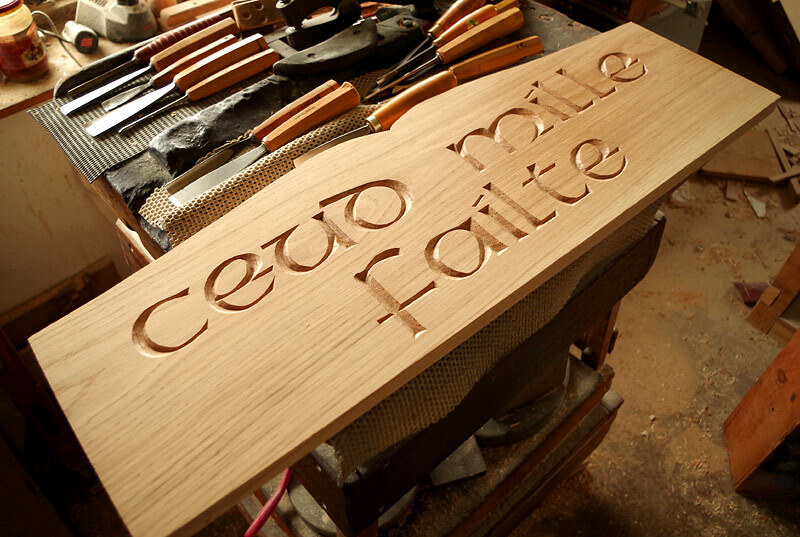 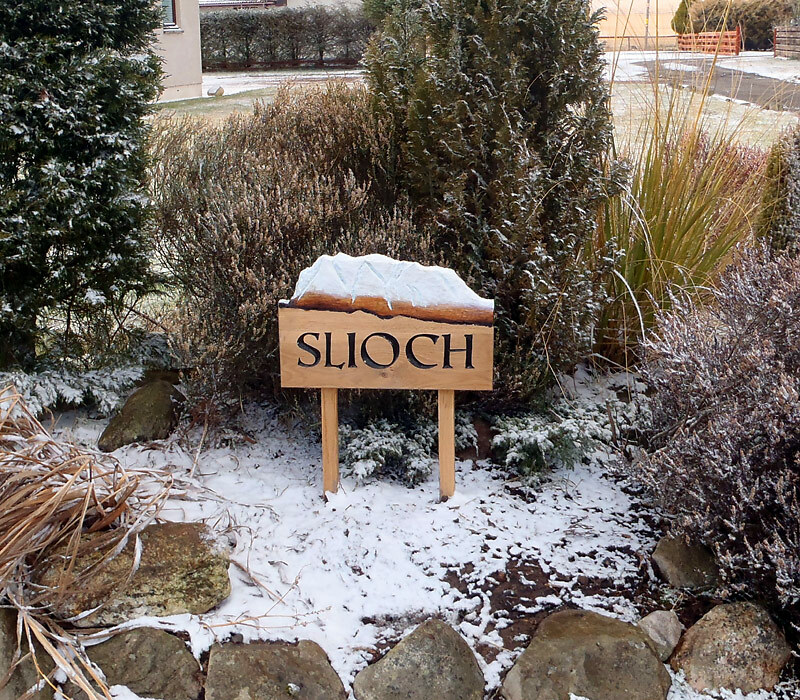 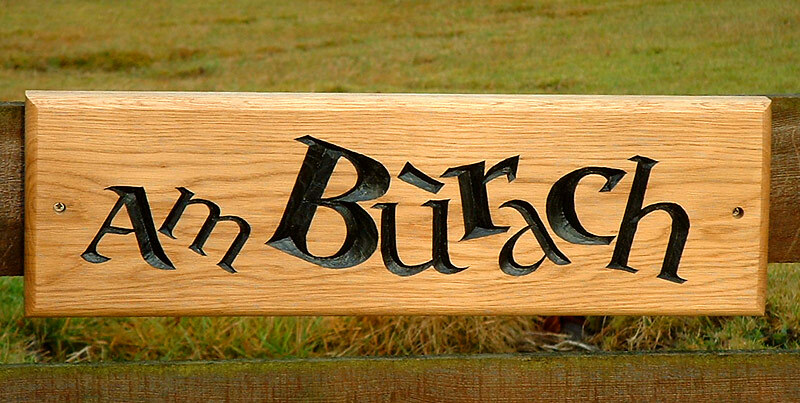 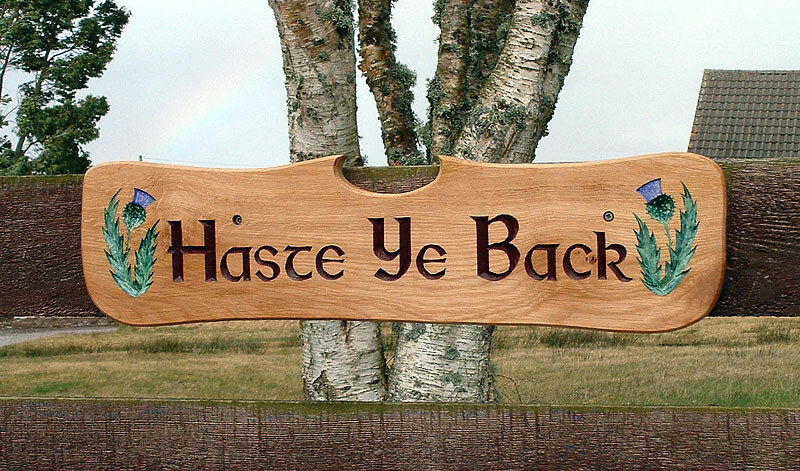 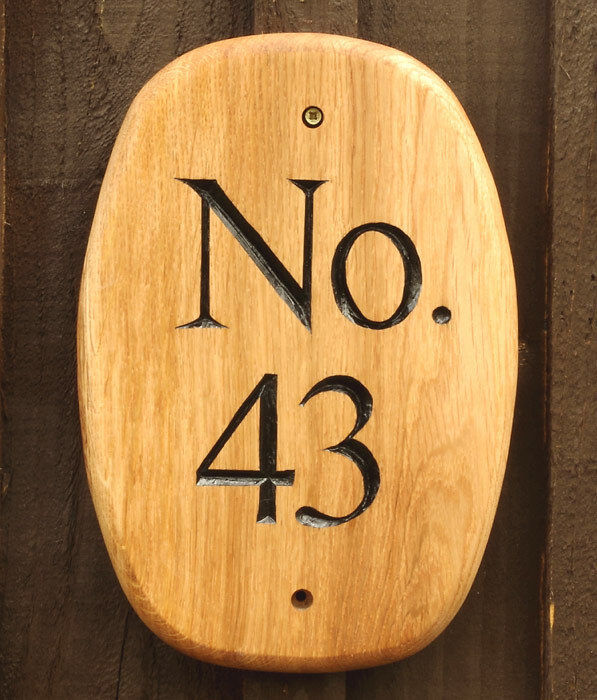 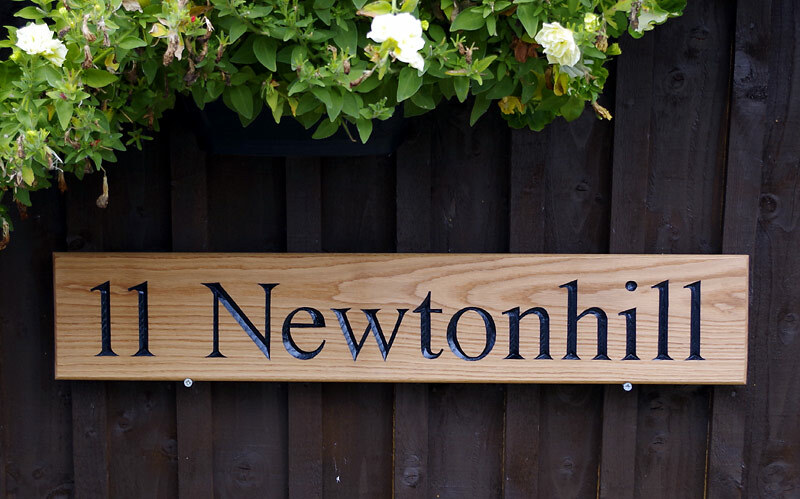 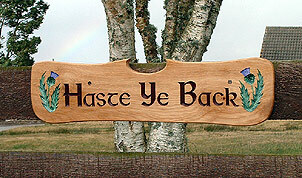 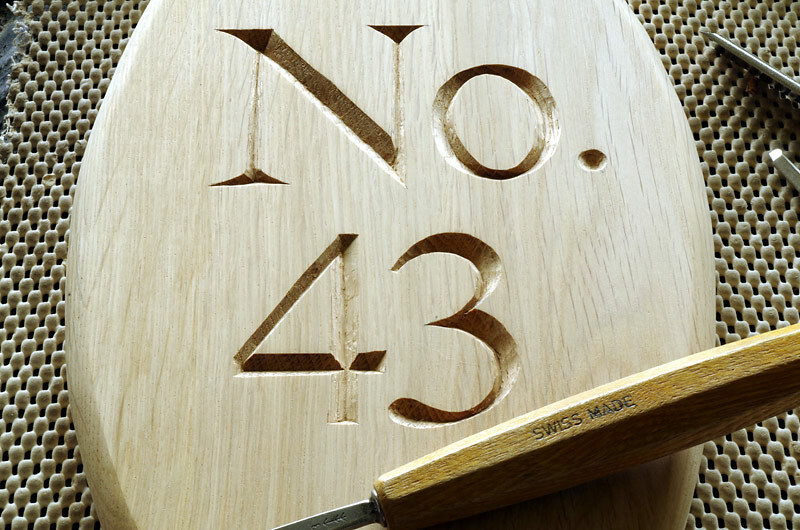 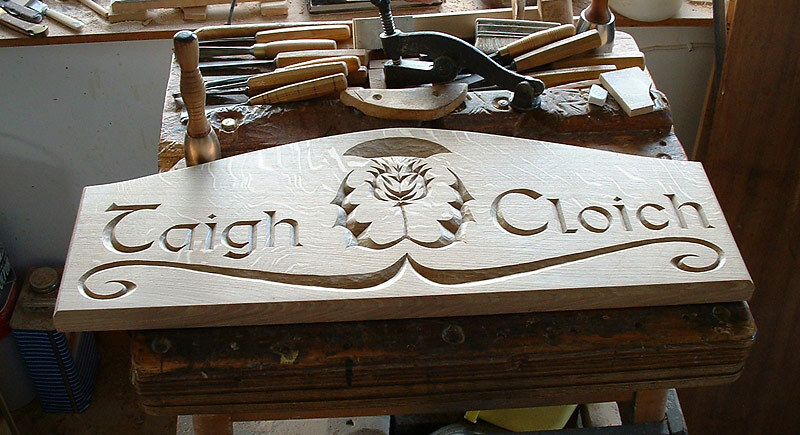 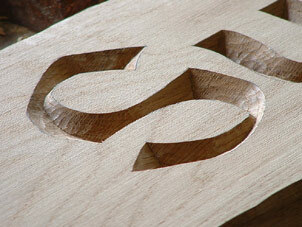 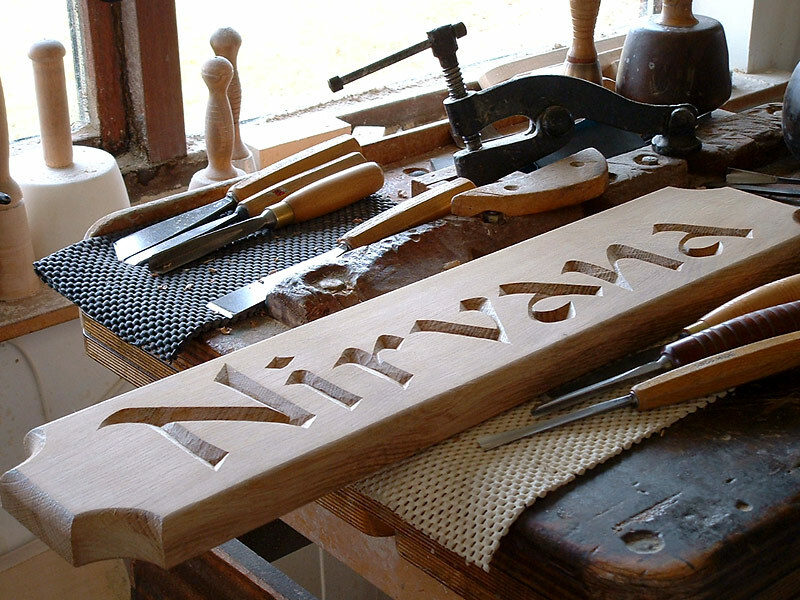 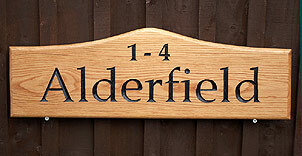 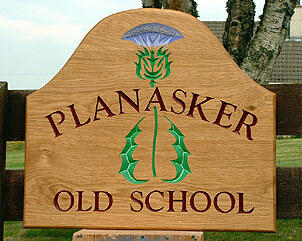 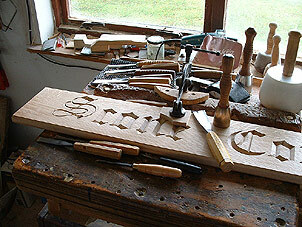 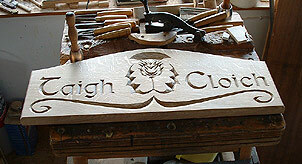 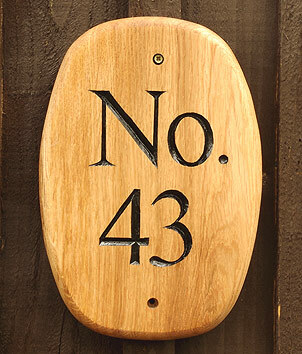 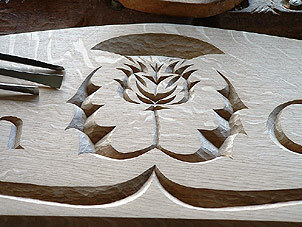 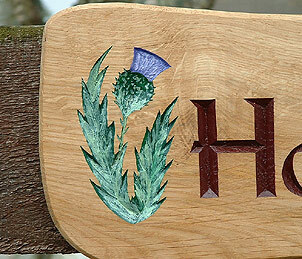 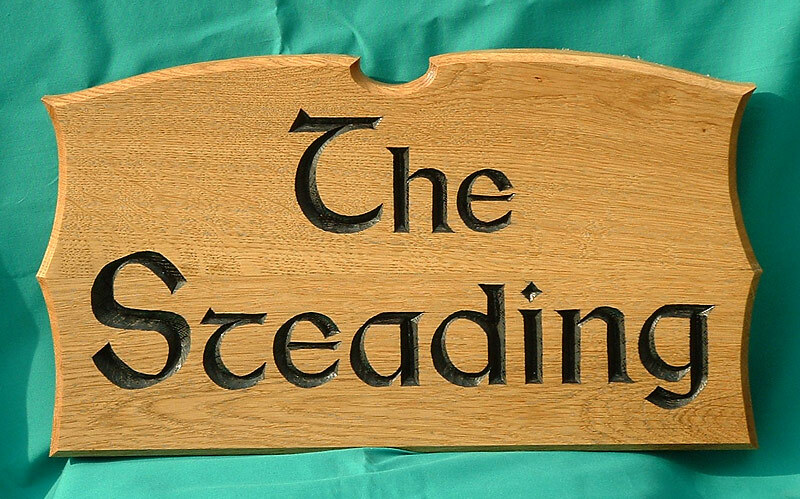 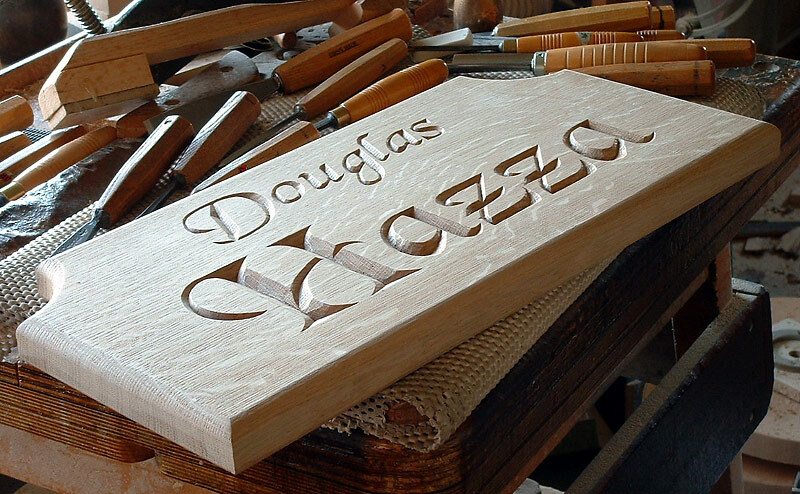 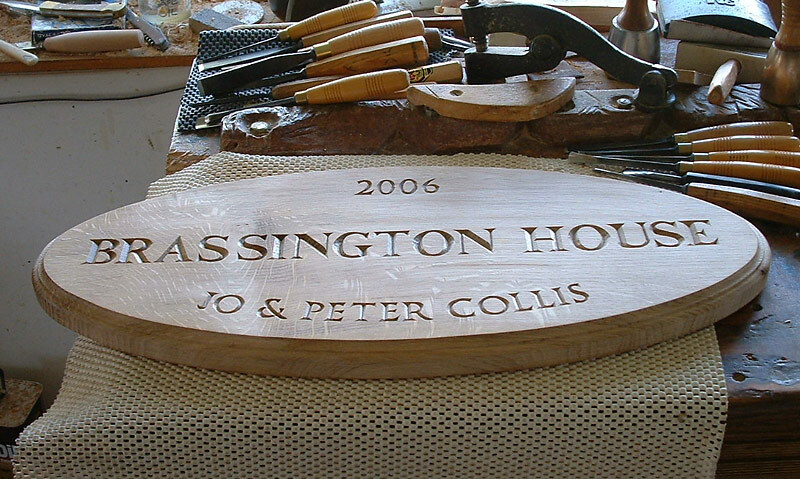 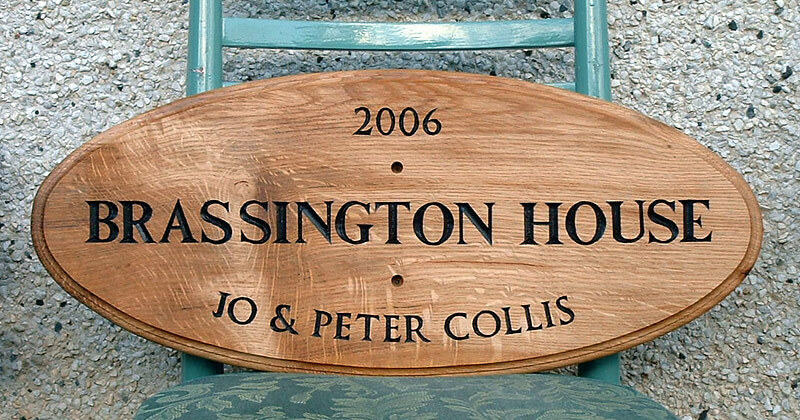 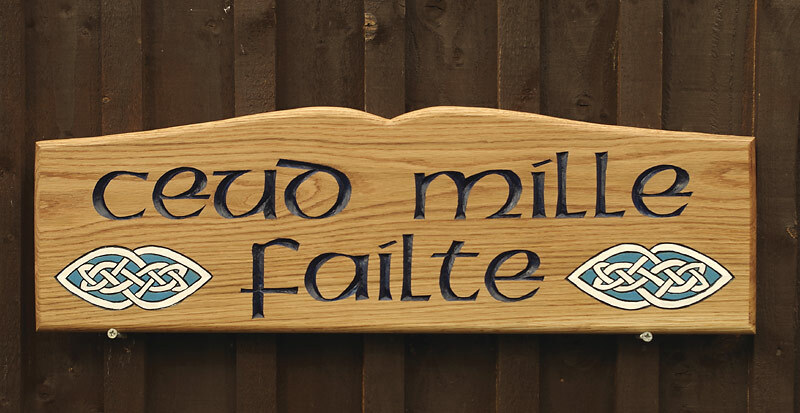 All the House Signs I make are hand carved from solid Oak that comes from a sustainable source. 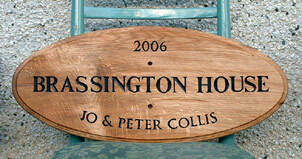 Every sign is different so it's almost impossible to set up an ordering system for them on my website. 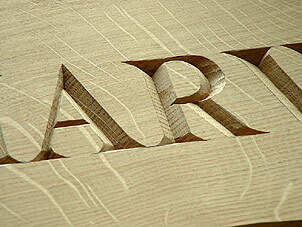 The best option initially is to contact me to discuss your requirements. 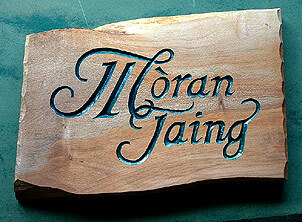 I will then show you how your sign looks in different fonts, and you can choose the one you like best. 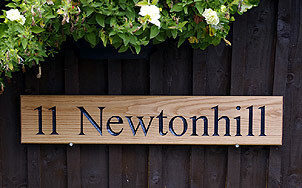 We also need to think about size of the sign which really depends on the viewing distance, how it's to be fixed, and if you want any extra decoration etc. 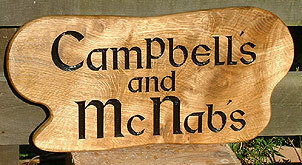 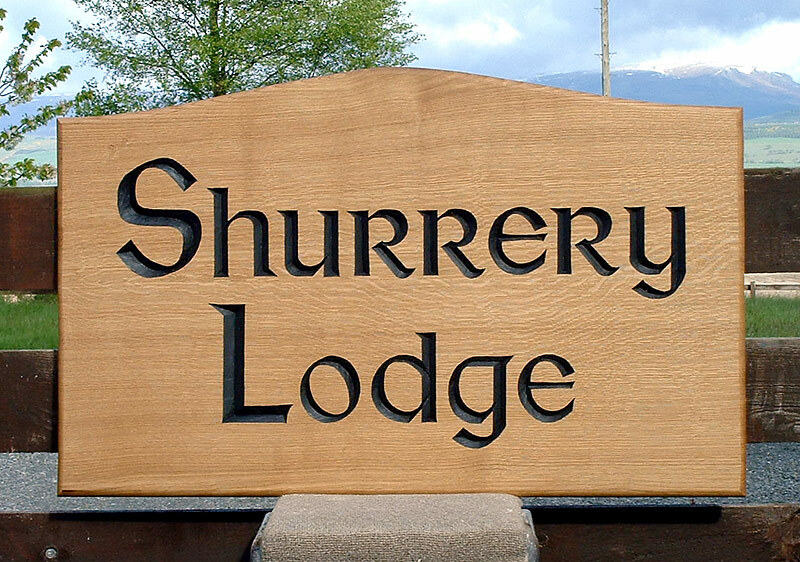 this is a lovely font "Black Chancery"
The finished sign has now been oiled. It will eventually weather down to a driftwood grey colour and should be good for a hundred years or more. 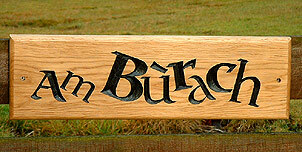 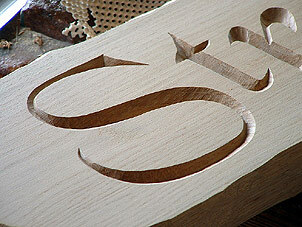 Deeply carved in a modern font.The shape is "rustic" in appearance. 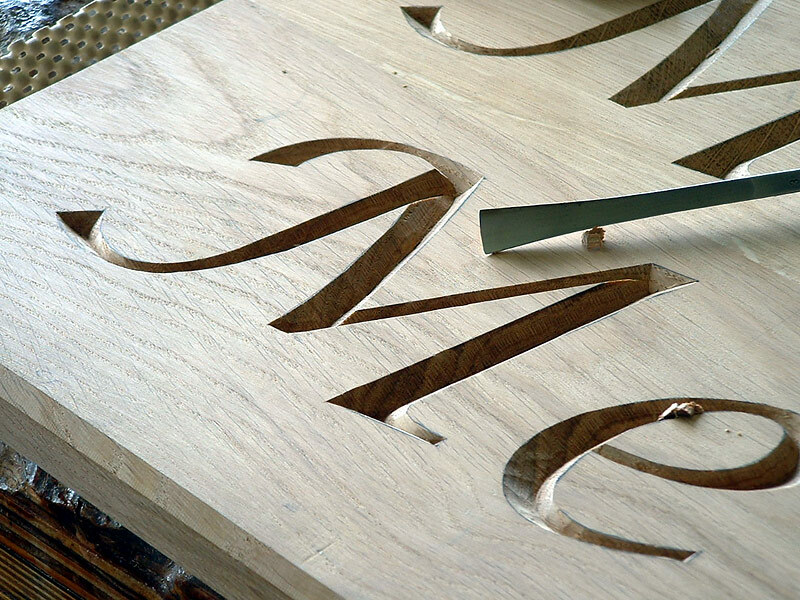 Closeup of hand carved lettering; it's quite challenging to get such a sharp edge. I think it was just oiled and the letters were left natural without painting. 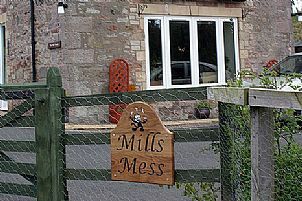 I haven't tried it but it's said to be a very good single malt whiskey. 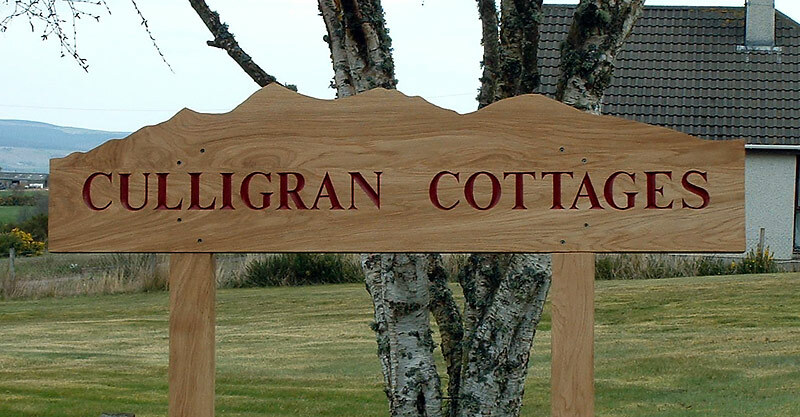 Clachan a Choin means "The dogs b-ll-cks" apparently in Gaelic! This was for two adjoining cottages on the far side of the Cromarty Firth from me. I can see them from my workshop. 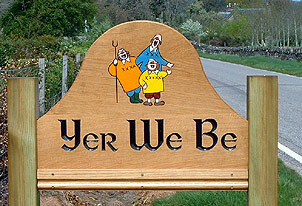 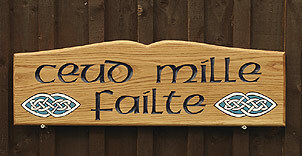 This sign went to Hawaii "a thousand welcomes" in Gaelic. 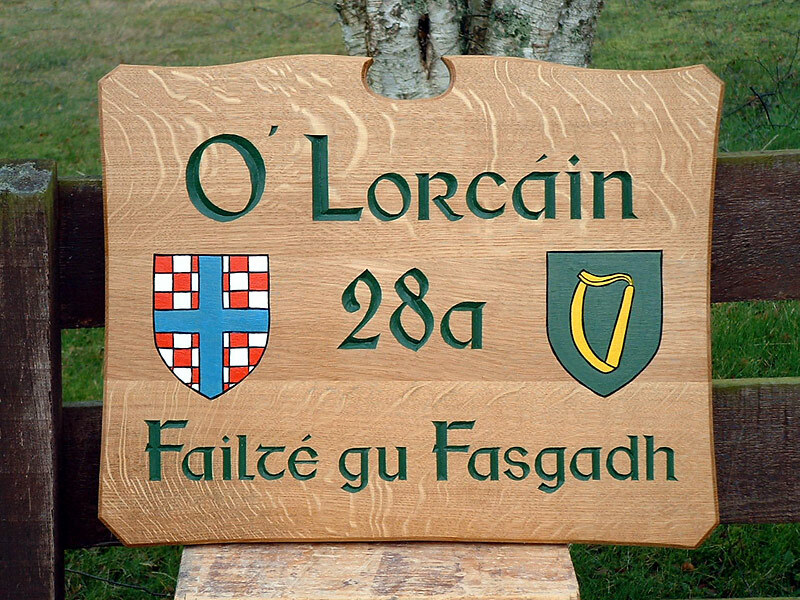 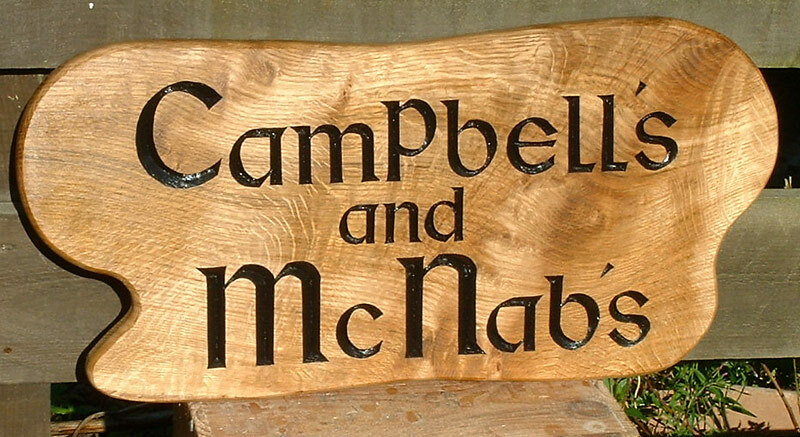 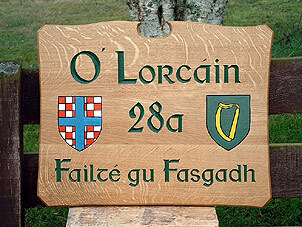 The finished sign with engraved Celtic Knot Work. There's a funny story about this one; it was commissioned by the contractor who damaged the original sign cutting the verge! This is 2 pieces of Whych Elm joined together. 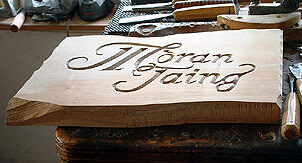 It was a job for "Farmhouse Furniture" who are nearby. The lettering was painted black and the sign had an oiled finish. 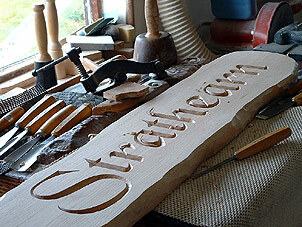 It's starting to go a pleasant driftwood grey as it weathers down. 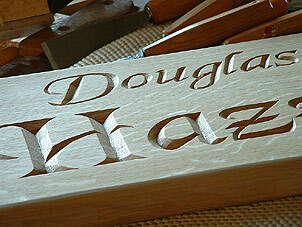 I supply Oak Plugs cut from the same piece of wood which completely cover the screws. This is just screwed to my shed for the photograph. 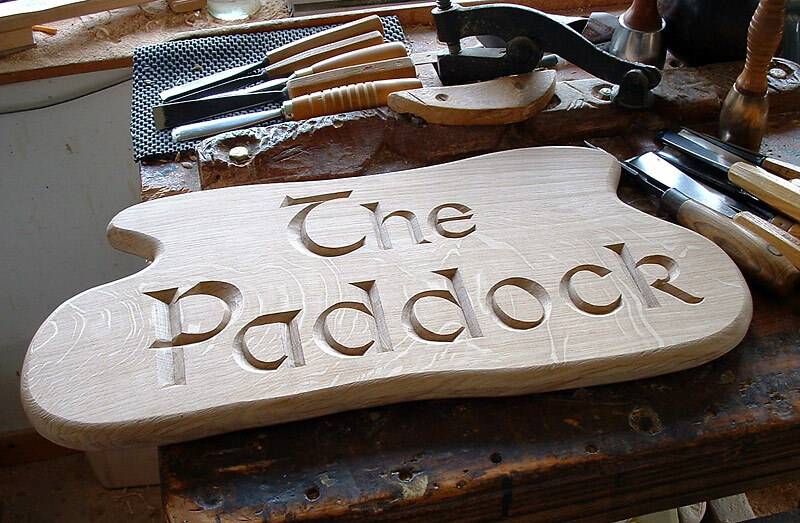 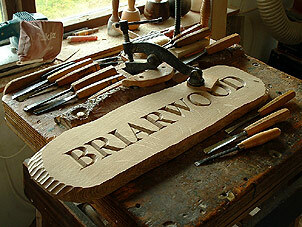 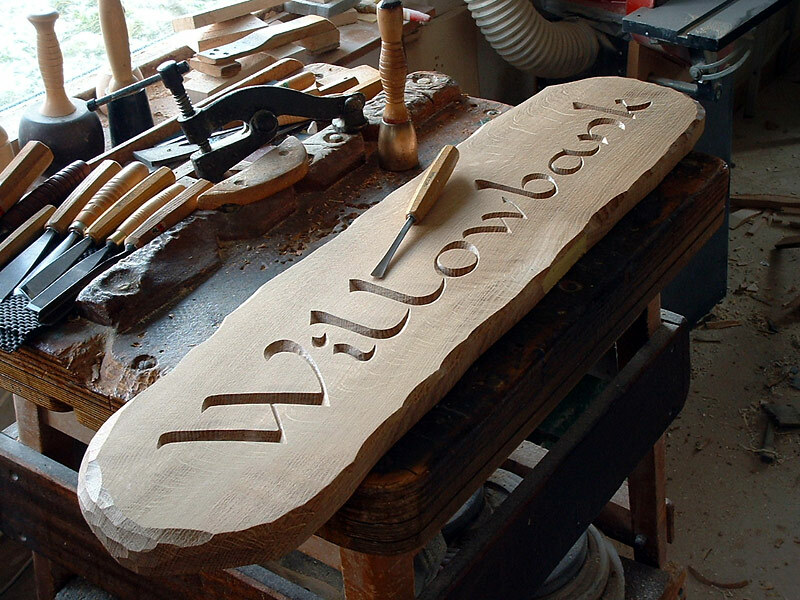 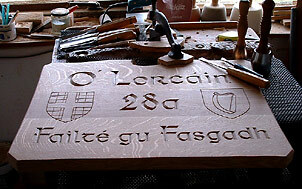 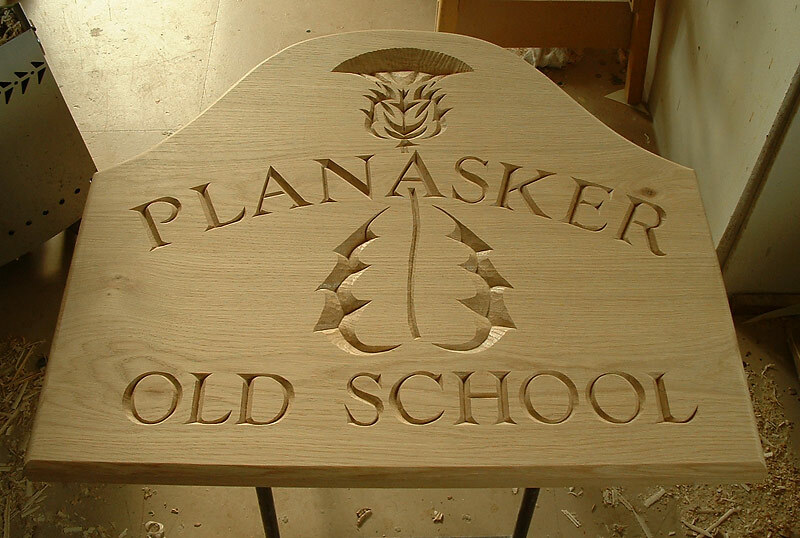 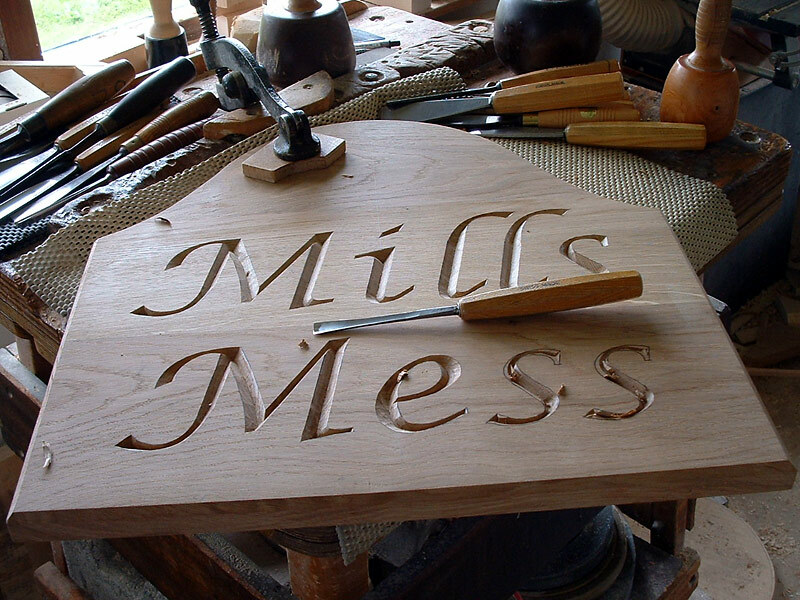 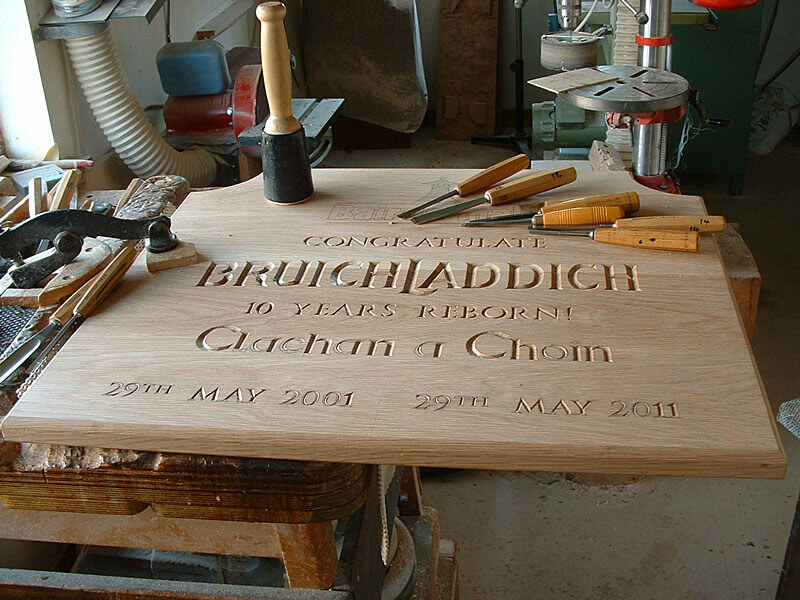 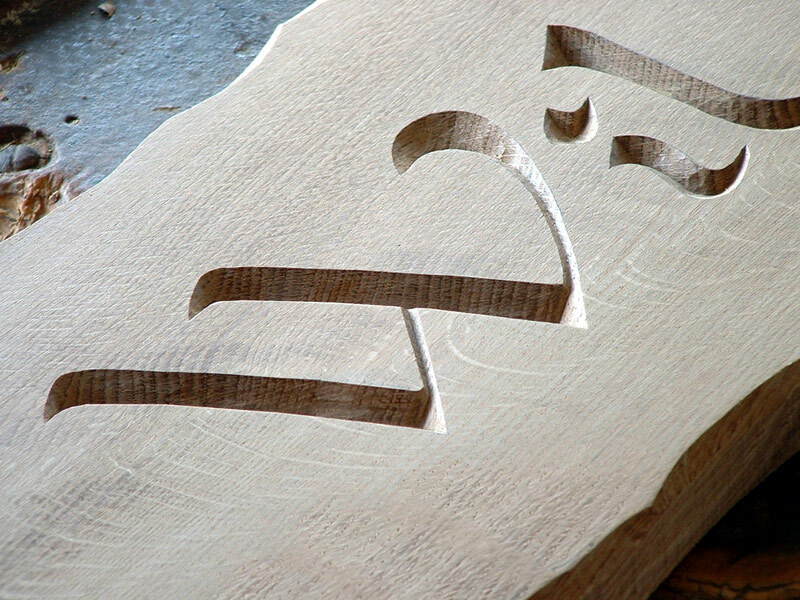 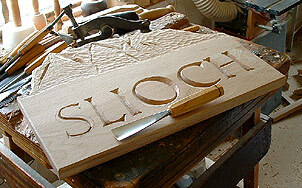 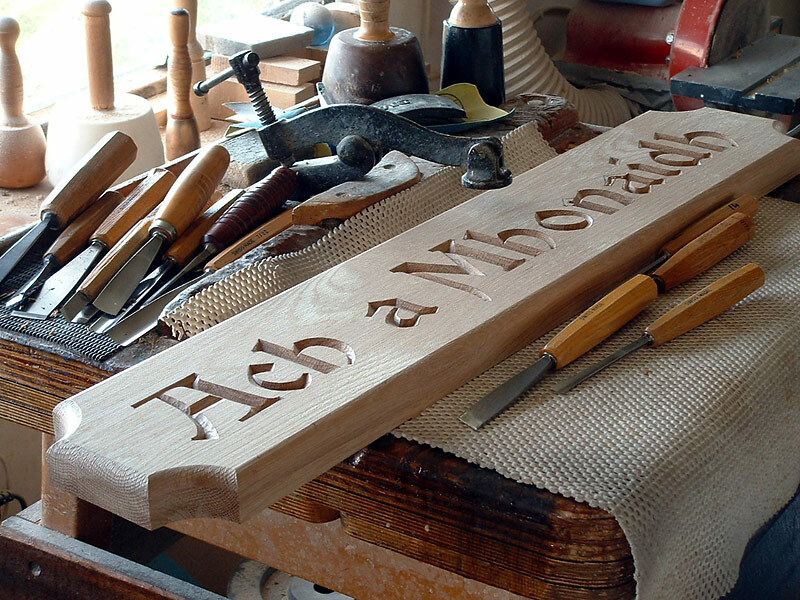 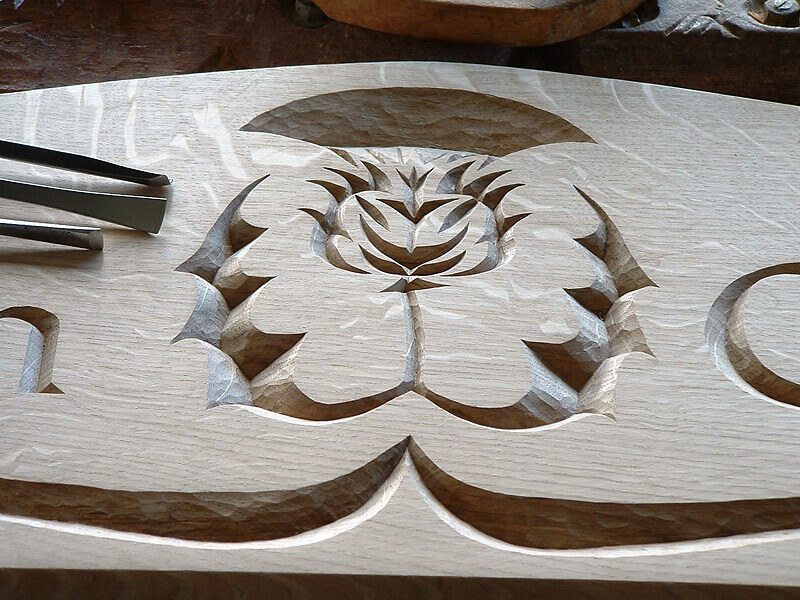 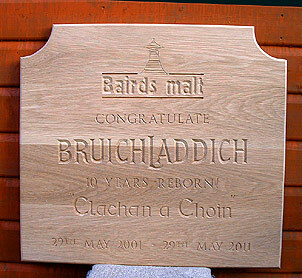 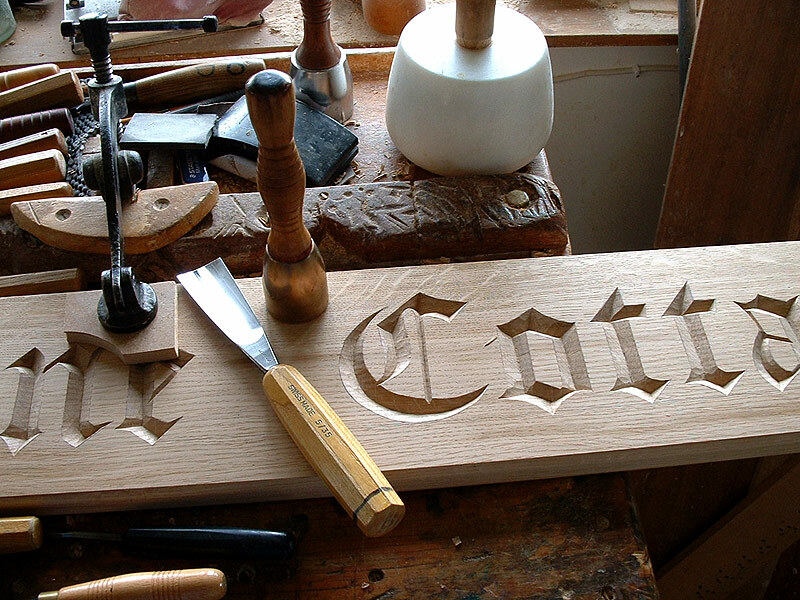 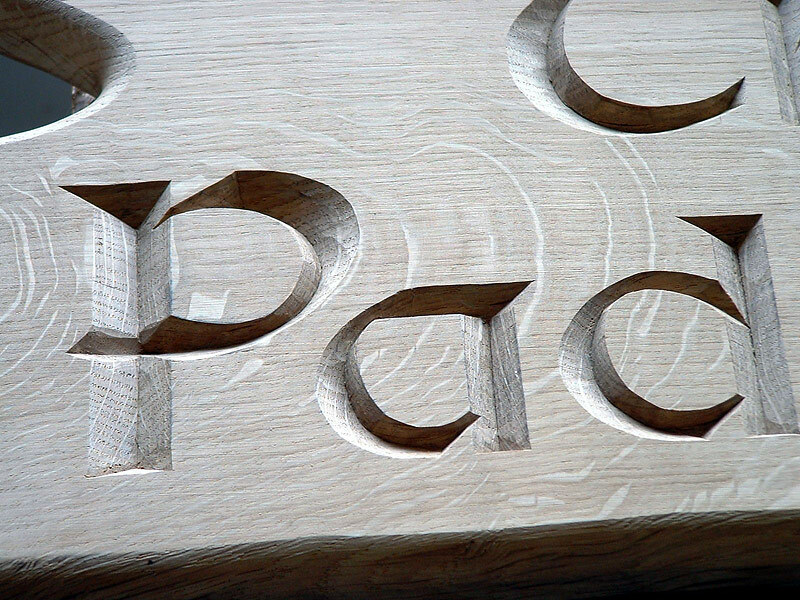 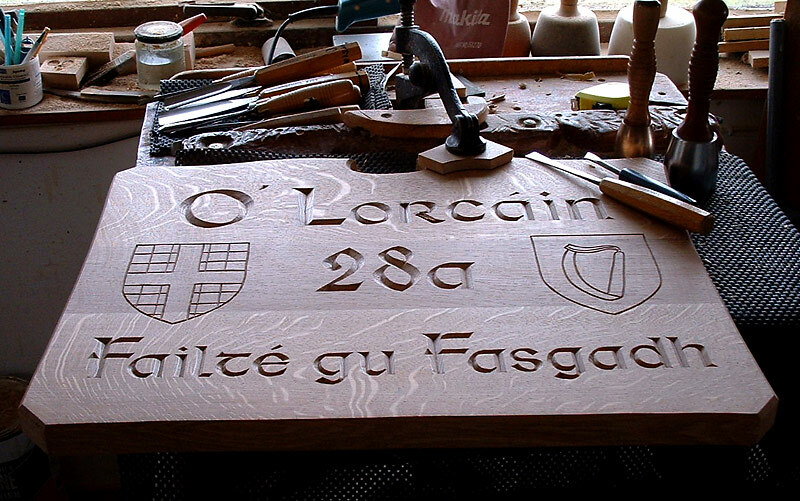 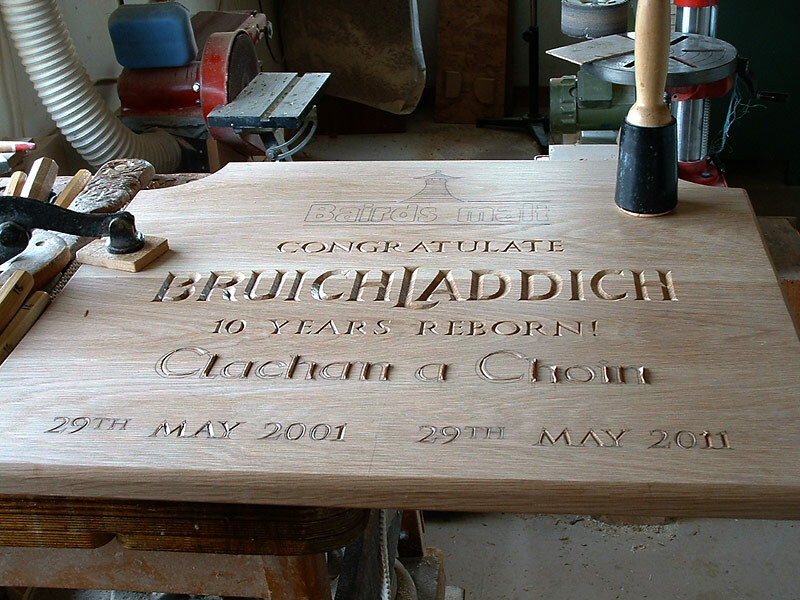 Another lovely font which was a pleasure to carve. 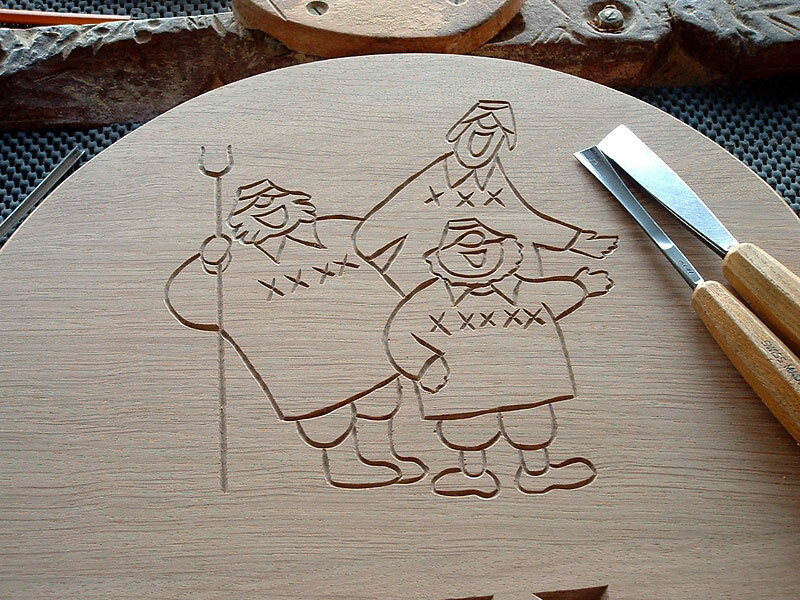 When you carve Oak with a sharp chisel it leaves a shine where it's been cut. 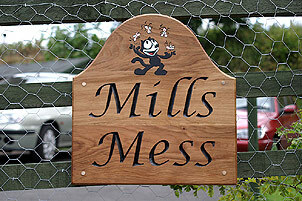 The finished sign temporarily on my fence. 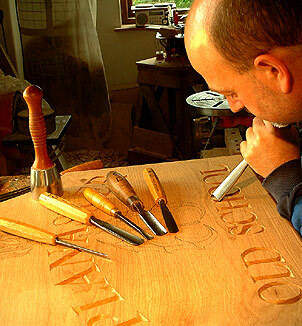 A 1936 Bentley known as "The silent sports car"if I did it now I would probably paint the car. 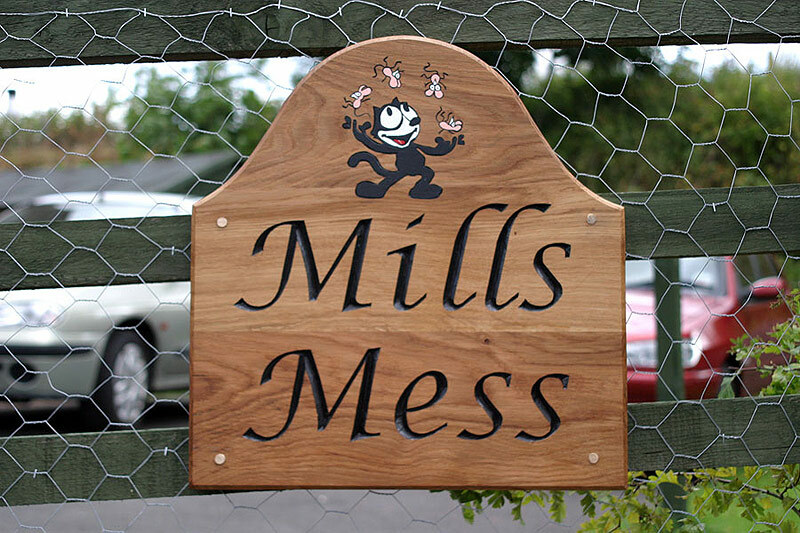 With a juggling Cat. 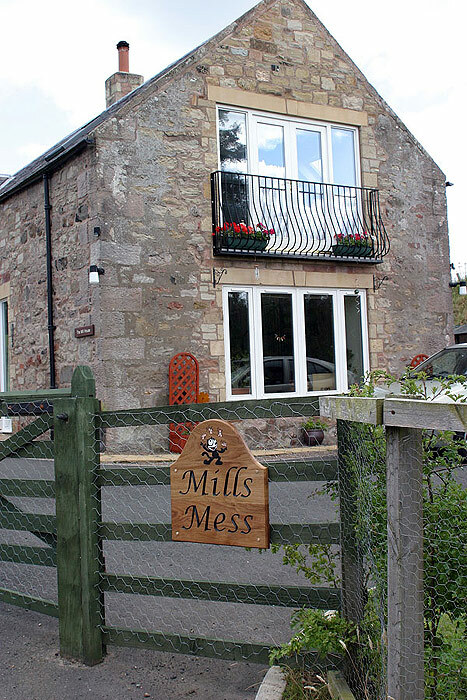 The owners are very fond of Juggling and entertainment. 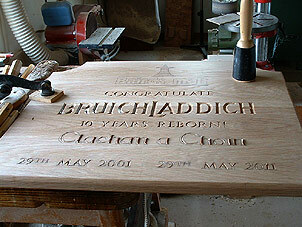 The artwork was supplied for this job by the customer. 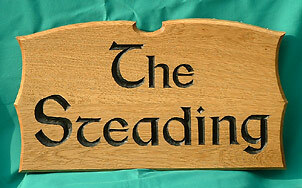 This was for the owner of the website "Shetland Otters" who takes people on Otter watching days in Shetland. 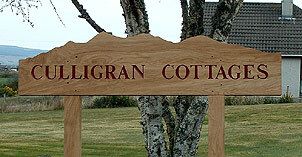 a silhouette of the mountains viewed from the cottages. The finished sign, screw holes will be plugged with Oak plugs making the fixing almost invisible. 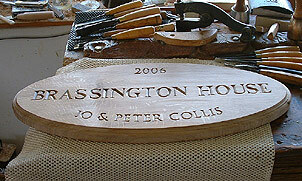 On the bench after hand carving the sign. 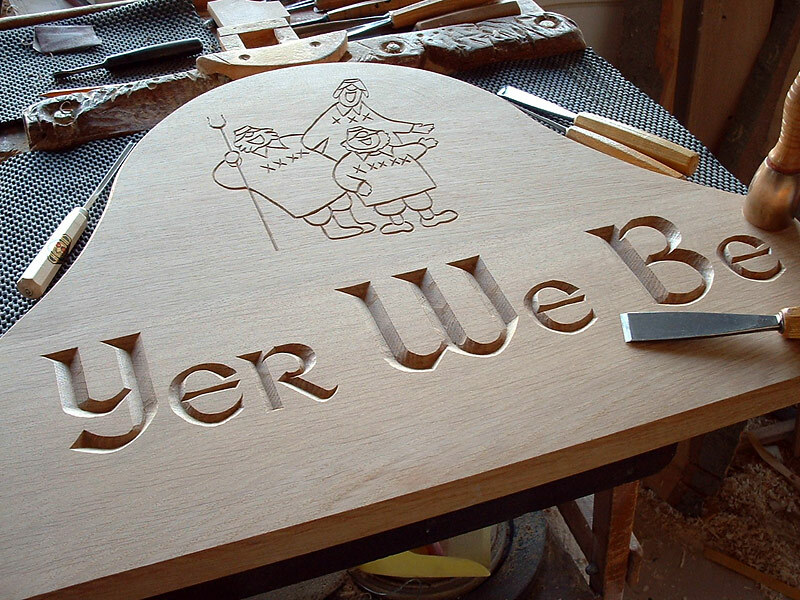 "I am a Cider drinker!"